...and be so exquisitely happy that you had another perfect day of a three-day in a row weekend of almost total perfection. For some weird reason I decided to tell everything backward...so tomorrow is going to be the surprise wedding. Which might take two posts...it was soooo amazing and romantic and unique! Don't forget to enter the giveaway for the "Too cool for school clock"! And now, since I am almost boneless with tired...I'm gonna wiggle my way down the hall on my stomach and go watch some inane TV. A surprise wedding AND a giveaway! Boy, do I have stories for you! Because the fancy schmancy engagement party we went to for our wonderful nephew and his beautiful fiance turned out to be their SURPRISE WEDDING! Coolest. Wedding. Ever. But I'm gonna stop chattering for this moment and tell you about the giveaway. I know I was going to tell you on Sunday but honestly, I lied about that. And I'm hoping that somehow the ridiculous early-to-bed-early-to-rise gene I've inherited from my Dad goes dormant and lets me sleep past 6 am. 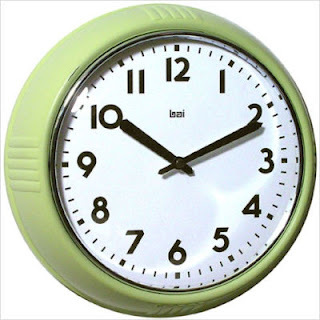 So...the giveaway this week is for this: Bai Design Too Cool for School Retro Modern Wall Clock in Chartreuse (but you can also pick it in black, orange or ivory. I got to pick the prize for the giveaway and it was awfully difficult. The sponsor for this giveaway is CSN Stores online mall. I spent some time out there looking around and they have everything from things like mailboxes to all all kinds of cooking items and the cutest baking items. Please take a second to go look at the mailbox site so they ask me to do this again! Then I can pick more cool prizes to share! Entry 1 - leave me a comment below. Any comment. Entry 2 - tell me you are a follower of my blog. Entry 3 - tell me in another comment on this post that you clicked on the mailbox link and the price for the mail box pictured at the top of the page. Now, obviously, this is an honor system cuz you can certainly look through the comments but then you will be consumed by guilt and it will give you all kinds of bad karma. And you don't want that. Really. And finally Entry 4 - entry can be earned by commenting on this post that you have posted a link on your blog - either sidebar in the text! Aren't you happy I don't know how to do twitter or tweet? Me, too! Wow. And after typing that and all the surprises going on around here this weekend I am exhausted. I just can't keep my eyes open so I am off to bed. I hope there are no more surprises tonight! I'm just getting wayyy too old for this! I'm even too tired to sigh. And that, my friends, is truly and honestly tired. I mean, seriously, WHAT A PARTY! You know how sometimes you give a party and afterwards you think I wish I would have done this and done that? I ate a tiny piece of left-over cake and I think I am hopped up on sugar. One more thing before I show you photos, K? Tomorrow is my first SPONSORED GIVEAWAY on my blog! I am sooooooo excited cuz I get to share a cool prize with you all AND if I do good they will let me do it again with a bigger prize! The giveaway will be all week but I just wanted to remind you! I'll be back tomorrow to tell you about the giveaway and hopefully put up a few more photos! I mean, seriously, does this rock or what? This is officially fun now! Things are getting done - woo hoo! Our daughter-in-law is getting her bee-hive done so Morgan is here today helping me. And Dad's finished picture board... I think it turned out good...disregard those two photos that just fell off... And the lipsticks I bought...even though they don't like quite as garish in this photo... And the laundry basket-o-planes that my husband assembled last night... and my emergency basket I always make up for larger events... pepto bismal, aspirin, lotion, tape, scissors, baby powder, kleenex, bandaids, etc. My appointment for my bouffant (apparently that is what they call it if your hair is short) at 1:30 is on track! I'm going to wait until my daughter-in-law gets back to show you her hair and then I'll hit publish and keep you all posted! Look, my granddaughter and I got everything loaded into the trunk and backseat of my husbands car! And our daughter-in-law is back, too. Look at this cute hairstyle! I got all the girls dice purses to carry. Aren't they neat! And now I can go get ready to run errands! Oh, I am having soooo much fun! And I'm not even stressed! And since that fact seems so unlikely I'll prove it is really me writing this post and not some alien abduction substitute. ACCCCKKKK!!!!! Why didn't you tell me it was Friday???? I think I'm pretty much under control. The first crisis of the day started when the girl that was coming to do all of our hair called in tears. She has a troubled husband who decided to become more troubled ... being vague but it was a horrible mess. I told her "no worries, it's just hair". I didn't panic until I realized "wait, this is Thursday, who am I gonna get to do hair on a Friday afternoon with no warning?" While I was realizing that I might have a problem with that, the photographer Chick called to tell me that she and her whole family were down with the stomach flu. She sounded on deaths door. I took a deep breath, wrote a panicked e-mail to PJ (thanks PJ!) and calmed down. Found someone else to do candid shots all night with my husbands camera but struck out in the hair department after one of my daughters, my Mom and I called every salon and beauty school in the area. I called everyone last night to tell them about the problem...Trying to come up with some alternatives...but nothin' yet. I'm wondering if Great Clips or one of those places could do it if I took a picture along? Hmmm.... or an old style beauty salon in one of the retirement areas? Surely those shops do 50 year old hair styles all day long. OK, thanks for listening to that...it gave me a new idea. Other than that I think I have finally organized my list of lists! and I even tried on my clothes yesterday. 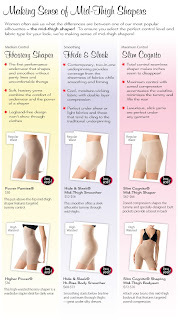 My spanx finally arrived. Certain that I would look exactly like the models in these pictures with this miraculous product I decided not to attempt to loose weight in the past six days. And .... Ummm... I need to write to some consumer place somewhere because it's not exactly how the whole thing is working out. And I'm gonna be honest here...I'm thinking breathing comfortably might be over-rated. After I had finally gyrated into it and put my dress on I did look a little slimmer. I made my husband hug me in my outfit and asked him if I felt skinnier. He said "well, you feel firmer" and I asked him like "firmer fat or just firmer?" AND HE REFUSED TO ANSWER ME! But I think he was still annoyed for me waking him up at 2 am so I could tell him "OH NO! I FORGOT TO GET BIRTHDAY CANDLES!" I think he mumbled something about "just kill me now" but I was running to my office to put that on the list of things I forgot to remember earlier. Or one of the many lists like that. In the midst of all the hair, photograph, final list issues I now don't know whether I am firmer or just have firmer fat. At least I don't have to worry about having not enough food for the four people who called yesterday to RSVP because obviously RSVP by January 10 is just a suggestion. I suspect I am not going to be able to eat much because I will be wearing that device of compression and torture. Thanks. Had to write down "take ziploc baggies" so I can stash some food in my bag to eat when I come home and take off said torture device. I apologize for all the sighing here this morning but I still can't catch my breath from having all my fat compressed into my abdomen and rib cage yesterday. So I am off to double and triple check my lists, loose 50 pounds, and find a miracle worker for hair. AND I promise I'll share a bunch of pictures. AND I'm beggin' ya please don't be mad at me today if I don't answer your e-mails. Because I'm trying to conserve my energy and my oxygen for later...when I'm wearing the spanx. Gross, disgusting, nasty, icky, giant bones. I am running for Grandmother of the year and with the whole Bone issue I think I may win. Not sure but a good possibility. Do you want to see the bones? They are gross. I hope you don't have an upset stomach. OK. Take a deep breath. I told you they were disgusting. You wonder why these disgusting bones are in my oven? Well.....January has been Dinosaur Month at our Granddaughters preschool. Dinosaur month has involved things like finger-painting dinosaurs, reading books about them, making dinosaurs out of candy. All kinds of non-gruesome stuff. But the first week of the month the teacher asked me if it was possible to bring in some bones to use for a dinosaur fossil hunt. So I cooked up some bone-in chicken and we carefully saved the bones. The following week the teacher talked to me again. "We have no-one else bringing in bones...is it possible you could bring about 20 or 30 bones in?" And me, being the perky A type said "of course, would you like different sizes of bones?" and she said "that'd be great!" My husband and I talked and he agreed that it would be a good idea to get some giant soup bones to make the hunt exciting. Which is actually a whole other story but this is long enough already. Ick. I really don't want to think about the bones anymore. First of all I wasn't sure how to get the rest of the meat and gristle off there so I tried baking them since they were too big for any pot I had. Yea, that didn't work. Made the whole house smell disgusting. But we baked them and baked them and the week before we were supposed to drop the bones off I made Morgan help me clean them. Well, I had her help me with the chicken bones. And finally on Wednesday it was time to take that great big pile of bones to preschool. I met my daughter-in-law at the elementary school to pick up the littlest sweetie. And she had a teary, snuffly face. While my daughter-in-law was putting Morgan in the car seat she told me that the little girl was having a bad day. She wouldn't eat her cereal. She was just crying off and on. So I climbed in the back seat with her, took her out of her car seat so I could hold her on my lap and asked her what was wrong. She did tell me, though, she did NOT want to go to preschool. She was going to my house. She was going to see "Gampa". I told her that it was dinosaur day at school and tried to talk to her about it but she was oddly quiet all the way there. No shouting "SLUG BUG!" No breaking of my eardrums with screams of "SCHOOL BUS! SCHOOL BUS!" When we got to school she wanted to be carried. Which was odd for her. And hard to do while balancing a box of bones on my other hip. And she just didn't want to go to preschool. "NO school! I want Gampa!" she cried. Finally she consented to go with her teacher and I peeked through the window for a few minutes to make sure she was OK before I left. Later when I came to pick her up I asked her if she had done the bone hunt. She said, "yes" in a funny voice and then added, "Gamma, dinosaurs are dead!" And I told her "yes, Morgan, they are extinct, but didn't we talk about that before?" And she told me..."I scared of school. A big, big bird was going to peck me...peck me and eat me! That big bird is a Brontosauruses. But dinosaurs are dead, Gamma. Even the Brontosauruses!" And then she put her sweet little index finger on her sweet little cheek and I could just see her mental gears trying to make sense of all this dinosaur nonsense. "Gamma, were those big, big bones in that box from a brontosauruses?" And I told her that brontosaures bones would be too big for us to pick up. And she told me "That's good Gamma, cuz dem bones was disguuuussstttttiiiing!" And that is my B post for the day - Brontosaurus, Bones and Birds ... ohhhh... and sweet, Beautiful, little girls, too! This is linked to Alphabe-Thursday! Thanks to the random integer thing-y we have a winner for the candy giveaway! I want some of those yummy treats!!! They look like the kind that when I chew them, they get stuck in my teeth and pull out my bridgework!!! What fun your party is going to be!!! Your dad is so lucky to have a little girl like you!!!! And don't feel bad anyone! I have another giveaway for Sunday! And a big story about doing a giveway so please come back! And don't forget to participate in Alphabe-Thursday! Before we get started today I have to share something with you. 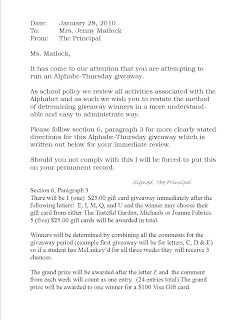 I received a notice from the principal saying I needed to be clearer with how the giveaway works. I am going to share this official document with you now. Please just click on the letter to enlarge it. I'm hoping this is more clear...and, if it isn't, please complain to the administration without naming names. Our letter for today, class, is the letter B! 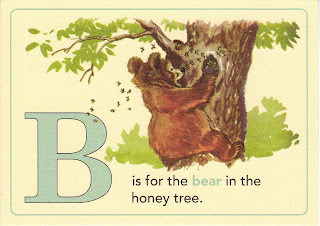 I love the letter B. Not only is it a great Beatles song (don't say huh? You know what I mean...) it is the first letter of so many wonderful things ... like Bacon and hmmm.... well, there definitely is a much longer list...I just can't think of it at the moment. You can link to this McLinkey until Saturday morning which means that although it technically says "Alphabe-Thursday" it is, in actuality, "Alphabe-Thursday and Friday" but I didn't feel like redesigning my button. If you're just signing up to do this you can go to our first Alphabe-Thursday link to see a lot more blah, blah, blah about how to do the whole thing! The letter A was actually really interesting. I was surprised at the diversity of the posted links. If you have any problems you can just put them in the comment section. I check my e-mail fairly frequently and I will get back to you as soon as I can. Don't panic, though. You cannot break the McLinkey. I promise you. AND if it gets really messed up I can get in there and delete your post and you can start all over. Just a quick reminder. These posts are to be PG - no exceptions, you must be a follower of this blog to participate, make sure you show the link back to this post and try and visit as many of the other participants as possible. Now, please sharpen your number two pencil and begin. And since you already have a sharp pencil please mark your calendar to check back on Sunday. I'm having an extra bonus Alphabe-Tuesday giveaway. The giveaway will run for a week! But I'm excited about it! Eyes on your own papers, please! You know how I told you about all the food the caterer was making? I didn't tell you that I came up with the brilliant idea of using cans of Spam for risers under certain trays. I love this idea. It makes me laugh. I told the caterer I would bring the cans along and he looked at me a little weirdly. I'm not sure why. Doesn't everyone use Spam on their buffet table? Besides. Spam is Crazy Tasty now. At least that's what the can says. Somehow, oddly, I doubt that to be true advertising. Gosh, I'm running out of time to tell you stuff. Did I tell you that we have a live swing band playing, which is cool! But do you also know that you can call Arthur Murray Dance studios and they will send a couple out who will do a dance demonstration followed by a little dance class - for FREE! I'm excited about this even though I don't dance. But I'm gonna dance on Friday night. After all, I will be in disguise and no-one will know it's me! Between the cats eye glasses, a beehive, and the authentic shades of lipstick I researched and bought (bright orange and bright red)no-one will believe that plain, old me could be so glamorous and exotic. So when the crowd gathers around the dance floor they will be struck with admiration and awe wondering "who is that glamorous and exotic woman wearing cat eye glasses and a beehive" and I will simply ignore them like the peasants they are and dance on...basking in the glory and dancing with wild abandon. And now for the sacrifice part of this post. I totally did this for you. If this doesn't prove that I appreciate you for reading my blog nothing ever will. Ladies and... ummmm.... ladies... I give you... I was shocked and amazed that hardly anybody knows this candy. This is possibly the best candy ever invented in the history of candy. It contains all natural ingredients such as corn syrup, sugar, corn starch, modified food starch AND artificial flavors and colors such as Red 40, Yellow 6, Blue 1 and Yellow 5. If that is not enough to whet your appetite I give you, in all its unwrapped glory...a Chuckles Jelly Candy Bar... Please take a moment to admire the glistening beauty of the sugar encrusted jewels of gummy goodness. Chuckles must be eaten in descending order of preference. Always. For me, the green one must be sacrificed first. Followed closely by the yellow one. And then and only then can you move into the sweet perfection that only the orange, black and red can give you. I am complete now. I have shared the glory of a Chuckles bar with you and I think, perhaps, my mission in life is complete. And since I feel somewhat cruel having tortured you with all this sweet perfection I am going to do a silly little giveaway .... just today... out of all the comments you leave. In the giveaway will be one of every single kind of candy I have on the candy table for my Dad's party PLUS a WW II foam plastic-y glider plane PLUS a pair of Cat's eye glasses. Can you imagine such riches? Well, if you are the lucky winner of this amazing giveaway you won't have to. I'll do the drawing tomorrow night around 8:00 pm Arizona time so any comments made before that time will be eligible. I won't, however, ship your prize out until Saturday or Monday cuz I am gonna be one busy, busy girl! And our letter for this week will be "B". Thanks for making this party planning so much fun! And to prove it I'm willing to put my Chuckles on the line. Did you miss the previous story in the ongoing party planning saga! 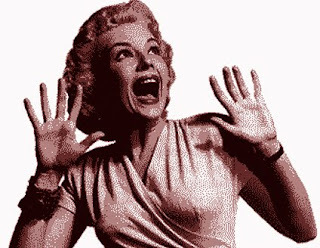 Don't panic...simply click here and it will be amazingly displayed before your very eyes! NOTE: There is a small chance that your particular Chuckles package may be missing the red candy. Probably not, but there is a small possibility and I am all about full disclosure here at the Jenny Matlock blog. To see the winner of this giveaway just click here! Confusion with a chance of sparkles! It's Friday, do you know where you brain is? A summer story for all of you freezing friends!